Whether you choose to use one of our amazing wedding planners, artistic photographers or energetic DJs, you know Social Chemistry Events has the experience to make your day special. Decades of experience will help take care of all the small details during your event. Our DJ's have access to over 80,000 songs, from the Roaring 20's, to the Hottest Top 40 hits of today. Our Wedding Planners can help you out with your own online planning forms and itinerary. And of course our photographers will have you looking your best! Your event will flow smoothly from beginning to end in our hands. 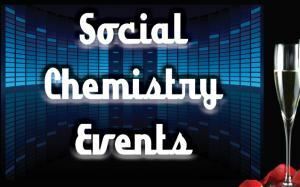 Our Social Chemists can handle everything from weddings, corporate events to a backyard party. Fully insured for your protection. Get an instant quote online now. Call for special promotions.